Make the most of rosy red blood orange juice in this seasonal cocktail, the Blood Orange Gin Fizz! This week I’m sharing Blood Orange Gin Fizz version 2.0! It’s a recipe I originally shared back in 2014 when I took all of my photos on Instagram in our tiny, poorly lit kitchen. A lot has changed in those three years EXCEPT my love for blood oranges and gin! So I thought it was about time that I gave it a bit of a makeover. 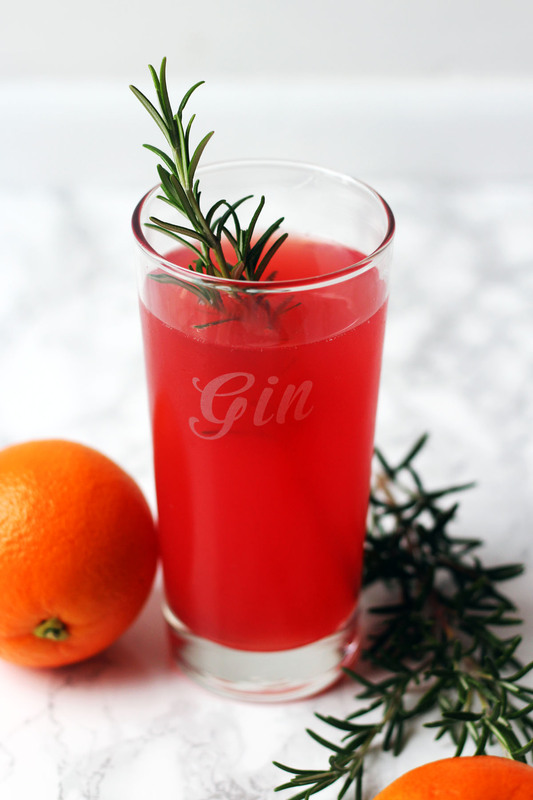 The recipe has stayed the same and this zingy gin cocktail is made with just four simple ingredients: (1) the juice of a blood orange, (2) angostoura bitters, (3) gin, and (4) tonic water. A Blood Orange Gin Fizz really is just a twist on a classic gin and tonic but the bittersweet flavour of blood orange adds extra depth of flavour. In terms of which gin to use, I went for Tanqueray 10 this week but Bombay Sapphire, Citadelle or something like Death’s Door would work really well! Tanqueray 10 is usually paired with grapefruit but I think the angustura bitters in this cocktail work really well to mimic the bitterness of a grapefruit. I’ve also started using herbs a lot more in my cocktails and the spring of rosemary I used as a stirrer for my Blood Orange Gin Fizz added an extra dimension to the cocktail. My Blood Orange Gin Fizz is and incredibly light drink which is a welcome break from sickly sweet fruit based cocktails that are full of artificial syrups. Blood oranges are best known for their deep red flesh which bleeds a rosy coloured juice as well as the mottled rosy hue of their peel. But the real reason I love them so much is that blood oranges are the perfect blend of juicy, sweet and tart. I’m also a big fan of bitters as they work amazingly well in gin based drinks. Use of the best of the seasons blood oranges in this zingy gin cocktail! Pour the juice of the blood orange over ice cubes in a long glass. Next add the gin and bitters. Give the drink a stir and top up with tonic water to the desired level. The blood oranges I had back in 2014 were really vibrant red. The ones I had this year were more blush. Unfortunately I could only get my hands on two and I forgot to photograph them before I made the cocktail! I really was in need of a drink…perhaps I’ll have to post a version 3.0 next year! I love the look of these Quick and Easy Blood Orange Cheesecakes from Farmersgirl Kitchen – naughty but nice! Last but not least is this incredibly versatile Blood Orange Squash from Tin and Thyme. I hope you bought a big bag of blood oranges because there’s lots of inspiration for you there! You’ll be eating blood oranges for days – enjoy! They are a little sour but not loads more than a normal orange! Perhaps you were unlucky! I have one blood orange left over, can’t decide what to do with it, but maybe right now I am fancying making a version of this as I treated myself to a bottle of Brecon gin last week. Mmmm hic! Oh how perfect! Love the addition of the rosemary, my favourite herb. What perfect timing 😀 it was clearly meant to be Helen! Absolutely gorgeous, making this and have pinned onto my cocktail board to keep a reminder – glorious gin recipe. Thanks Ren 😀 your comment has put a big smile on my face!!! The color on this cocktail is so darn inviting – hard to resist this simple elegant drink! This looks so delicious and refreshing!! Love the vibrant colour; I’ve yet to see any blood orange here, but I keep looking as I’m desperate to try one!! Fingers crossed you find one soon! I wanted to dive into this the moment I saw it! The colour is amazing and I bet it tastes divine! Not normally a fan of gin but would love to try this with vodka instead! !